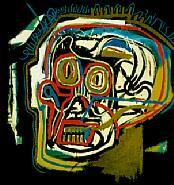 This is print is from an edition of 85, that is included in a portfolio Jean-Michel Basquiat Editions. This is a posthumous publication approved by The Estate of Jean-Michel Basquiat and signed and numbered by Gerard Basquiat the administrator of The Estate of Jean-Michel Basquiat. The work is a hand pulled screenprint derived from paintings by the artist executed in 1983-84.